Nestled in the Pyrenees, Lourdes has been a major pilgrimage site for Catholics for over a hundred years. It was here that Bernadette Soubirous is thought to have witnessed numerous apparitions of the Virgin Mary. On this private tour, choose from morning or afternoon departure times, and meet your guide in the city center. 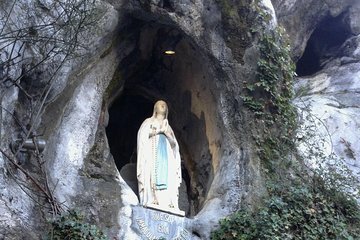 You’ll visit Soubirous’ childhood home, will learn about her life and later canonization, and will have time to discover the Sanctuary of Our Lady of Lourdes.